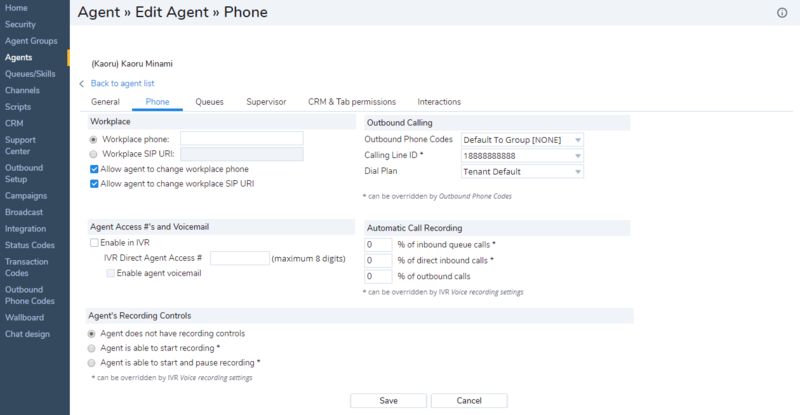 Administrators can define agent workplace phone settings and outbound calling preferences, and specify direct agent access details and call recording settings via Agents > Phone. Workplace Enter the agent's Workplace phone or Workplace SIP URI at which agent wishes to be reached. An agent requires a standard wired, cellular, or VoIP phone to process phone interactions. The workplace phone number can be set to any dedicated extension number or a DID number as needed. The workplace SIP URI is used when the agent has a soft phone approved by 8x8 installed on their workstation. Note that the agent's extension number appears in the Workplace Phone field when you first assign an extension to a user. You can also control the ability of agents to change their phone number or SIP Phone URI from the Profile tab in Agent Console. The agents are granted the permission to change their workplace phone or SIP URI by default. Outbound Calling Outbound Calling preferences let you select a dial plan per agent to translate outbound dialing numbers. It allows you to define a custom Calling Line ID for all calls placed by the agent. Agent Access Number and Voicemail The settings allow you to activate direct agent access for an agent, enter an extension number to reach an agent directly by passing the IVR, and activate the agent's voicemail. Automatic Call Recording If call recording is permitted for the tenant, you can specify the desired percentage of inbound, outbound, and direct agent access calls to record. Agent's Recording Controls These settings determine whether or not an agent can record calls. Click or to add or edit an agent's account. Enter or select the desired settings from the available options. In the United States, phone numbers must be 1+(three-digit area code)+(seven-digit phone number). When typing numbers in Agent Console text entry areas, always preface the area code with 1. Note: The NANP dial plan translates phone numbers without the prefix as well. Outside the United States, phone numbers must be (Country Code)+(phone number). If enabled by the administrator, agents may use the My Profile tab in Agent Console to change their phone number later. Workplace SIP URI If the agent uses a VoIP telephone, then in the SIP phone URI text entry area, type the VoIP phone's full URI. Virtual Contact Center uses that URI to connect phone interactions to the agent's VoIP telephone. If enabled by the administrator, agents may use the My Profile tab in Agent Console to change their phone number later. Allow agent to change phone Number Control agents' ability to change their phone number. If selected, agents can change their workplace phone number in the My Profile page of Agent Console. Allow agent to change SIP Phone URI Control agents' ability to change their phone number. If selected, agents can change their SIP Phone URI phone number in the My Profile page of Agent Console. Outbound Phone Codes By default, an agent inherits the Outbound Phone Code List assigned to the group they belong to. You can change the selection here. Note: The agent's Calling Line ID is overridden by Calling Line ID set by Outbound Phone Codes. Dial Plan Choose a Dial Plan to translate outbound dialing numbers. Select from the International Numbering Plan, North American Numbering Plan, or any custom plan defined for the tenant. For details on dial plans, refer to Understand Tenant Dial Plans. Enable in IVR If enabled, allows the agent extension number to be recognized in the IVR during a Menu or Get Value input operation. You can reach the agent directly by entering a two- to eight-digit extension. IVR Direct Agent Access # (Maximum 8 digits) Allow a caller to use an extension number to directly contact this agent. Enter a two- to eight-digit extension number that callers can use to reach the agent directly. Enable Agent Voicemail If enabled, activates an agent's voicemail and routes direct agent access calls to the agent's voicemail if the agent fails to accept an interaction within the interaction offer timeout period. Virtual Contact Center uses the email address specified under Agents > General to email Direct Agent Access voicemails to the agent. Note: If the agent's telephone has a private voicemail box, ensure that the Virtual Contact Center voicemail timeout threshold occurs before the agent's voicemail box seizes the call. Specify the percentage of automatic call recording for the agent. Enter a percentage of inbound, outbound, and direct agent access calls. Agent does not have recording controls Prevents an agent from recording a call by taking away the recording control in the Control Panel. A call may still be recorded based on the automatic call recording settings. Agent is able to start recording While on a call, an agent can start recording the call anytime. The recording ends on terminating the call. Agent is able to start and pause recording An agent can start and pause recording a call any number of times. An agent may be denied recording rights with certain IVR settings. Visual feedback in the Agent Console Control Panel always reflects the true recording status. The next step is to assign queues to the agent.